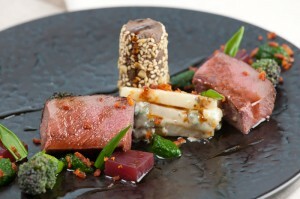 Roe Deer Venison marinated in Liquorice and Mugwort, Dukkha venison, Yorkshire Blue Potatoes, Wild garlic puree and Damson Jelly. Wowza this is a beauty of a recipe but I am afraid only for the most serious of wild cooks because you will have to pull on the wellys for this one! And it is intricate cooking. Mugwort, Wild Garlic, and Damson gin (already made and well marinated! Quite simply gin, sugar and picked washed damsons) Why not see our Sloe Gin Blog? Leaves from 2 stems of Mugwort. 3 sprigs of Wild garlic shoots for each plate gently washed and allowed to dry. 3 large washed red potatoes peeled and thinly sliced on a mandolin. Marinade the mugwort leaves in the liquorice and all over the venison and then vac Pac each piece of venison in the marinade (you can alternatively cook in the oven if you do not have a Vac Pac machine and a water bath). Alternatively seal the meat in a hot frying pan and place in the oven at 180ºc for 8-12 mins until cooked. Reheat in foaming butter and slice trim then carve in half and serve. Seal the venison in a hot pan then place the red wine in the pan and the vegetables cover over with a tight fitting lid and braise slowly for 1 ½ hours on 160ºc until tender and cooked toughly with some venison this make take another ½ hour depending. Allow to cool and then flake gently and place in a kitchen aid on a paddle beater and mix until the fibres of the meat are broken down but still have their texture. To this add 200 ml of much reduced Venison Jus and chopped fresh herbs. Roll this in cling film and set in sausage style rolls tied at either end. Place to chill in the fridge and once set slice into portions and roll in Dukkah rub. This is made up of Cardamom, Sesame Seed, Peppercorns, light Indian spices and if you do not wish to make yourself you can buy this amazing product from M.S.K. Pan Fry the rolled Dukkah venison cylinder and re heat in the oven for service. Strain the liquor you cooked the venison in for the sauce and reduce this down to a sticky paste season and knock in 50 g of cold cubed butter to give the sauce a shine and serve. To make the wild garlic puree simply boil some water enough to plunge the wild garlic shoots into then refresh under a cold tap and puree in a blender with some melted butter or Yorkshire rapeseed oil and season with salt and a little nutmeg. Alternatively you can easily make this in a Thermo mix if you are lucky enough to have one! Simply cut the tips down and blanch by plunging into salted boiling water until cooked then and refresh under the cold tap until al-dente and re heat in a little butter and season with salt. Then serve. Layer the potatoes in a butter greased container of your choice a small terrine mould or even a Pyrex dish. Layer the potatoes slices with the cream and thyme and the crumbles Yorkshire Blue leaving some for the top of the potatoes and cook at 180ºc for ½ hour to 40 mins until cooked. Allow to cool slightly and remove from the mould and slice if required then serve. Bring ½ the liquid to the boil and thicken with a level teaspoon of Agar Agar powder. Stir in until dissolved then sieve through a fine sieve and set in a tray lined with cling film in the fridge. Trim the loin of Roe Deer after heating through in butter and then cut once down the top of the loin to the bottom running with the grain of the meat instead of against the grain. Place the venison Dukkah cylinder upright on the line of food. Serve the venison with a sticky jus reduced from the liquor used to cook the shoulder of venison.